The REMINDER (Reduction of heart failure morbidity in patients with acute ST-elevation myocardial infarction) trial was a randomized, double-blind trial of 1,012 patients who had a heart attack caused by a complete blockage of one of the heart's arteries. Patients had no signs or history of heart failure. They were given either eplerenone or placebo in addition to standard therapy. Overall, patients taking eplerenone were 38 percent less likely to have poor outcomes than those given a placebo. 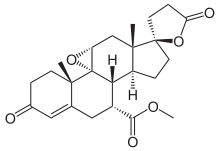 Eplerenone counteracts a hormone called aldosterone, which can increase blood pressure. The drug is currently approved to treat hypertension and as a treatment for patients who have heart failure several days after a heart attack. "This is the first randomized trial to test a mineralocorticoid receptor agonist during the acute phase of heart attack, and the results suggest a clinical benefit," said Gilles Montalescot, MD, PhD, lead investigator of the study and professor of cardiology and head of the Cardiac Care Unit at Pitié-Salpétrière Hospital, Paris. About 5.8 million Americans have heart failure, a condition in which the heart cannot pump enough blood to meet the body's oxygen and energy needs. Improvements in heart attack treatment have increased chances of survival, but damage after heart attack is one risk factor for heart failure. Clinical trials and registries show that in the 30 days after a first heart attack, between 8.6 percent and 40 percent of patients will be diagnosed with heart failure.